I recently wrote a rookie introduction to the points/miles collecting game, but I wanted to double back and add another important tip. Many people I have talked to lately get incredibly frustrated when collecting and redeeming points. They fly their preferred airline a ton, save up a boat load of points, and when they are ready to book? Zero viable options for their travel dates. I don't know a lot of people with work schedules that can be changed on a whim. When folks make vacation plans, the dates are usually set in stone. If that sounds like you (and for the vast majority of America, it is), then I highly suggest you focus on accumulating FLEXIBLE points. These types of points can be transferred into multiple airline and hotel programs, allowing you to create a great vacation out of thin air. No longer will you look on Delta's website in disgust and give up when there are no awards that fit your schedule. You will have options, and that goes a long way when booking travel. Which are the best "flexible points" programs? There are three that come to mind. I will preview the Starwood points today, and the other two great flexible point programs (American Express Membership Rewards and Chase Ultimate Rewards) in the coming days. Make sure to catch all three posts. I already wrote up the Starwood Preferred Guest program here, but I wanted to expand a bit on its usefulness. For me, there is no more valuable currency than Starpoints. I have the ability to redeem for some truly incredible hotels (think "W", St. Regis, and Westin properties) or I can turn them into airline miles in many programs at a 1:1 ratio. The best part about transferring into airline miles? Starwood will kick in 5,000 miles for every 20,000 Starpoints you transfer. You can convert 20,000 Starpoints into 25,000 American Airlines miles. That's a nifty 25% bonus! The list of transfer partners is truly expansive. The two I use most often are American Airlines and U.S. Airways, but there is value in swapping to others as well. I can't say enough good things about the potential transfer options. The only drawback is that transfers usually take 1-2 weeks, so planning ahead is very important when transferring. After all, an award ticket you see today might not be there when your transfer is finally completed. Also, Starwood is not the program to use if you value United miles. Starpoints transfer to United at a paltry 2:1 ratio, so you will really lose out by doing so. 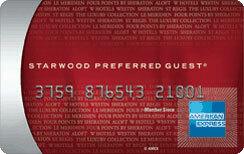 Ways to Earn: American Express Starwood Preferred Guest Credit Card, hotel stays in the Starwood brand (e.g. Westin, Sheraton). Pros: Variety of useful partners. 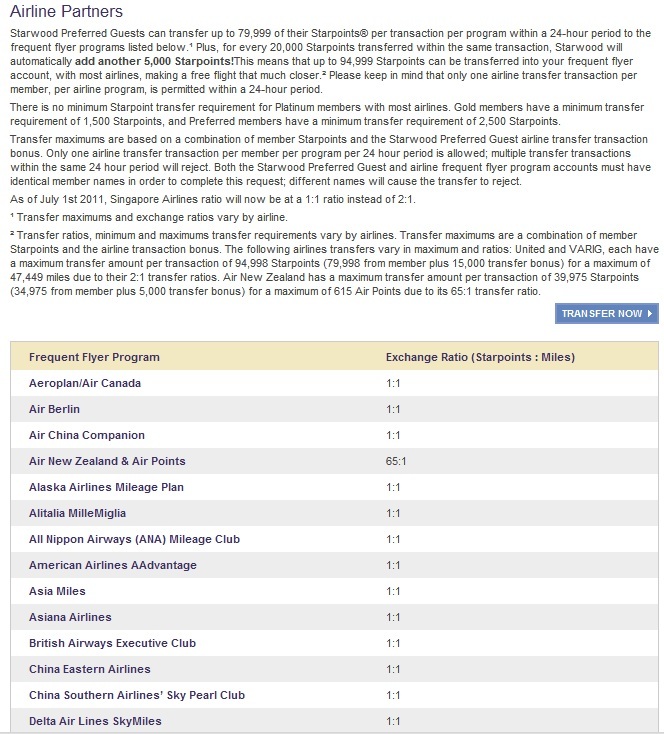 5,000 point bonus for every 20,000 Starpoints you transfer to an airline. If you have any questions about this post, don't hesitate to write me an email. I also respond to questions on Twitter. Keep the queries coming! This Online Casino Österreich bonus feature activates when three or more bonus symbols which are scattered find their ways to the reel! Once the feature has been initiated, you'll need to spin a wheel in order to access the awesome cash prizes that you want https://online-casino-osterreich.at!